Dr. Jyoti Hegde is a corporate soft skills trainer and a life skills trainer for students. Her passion is to conduct sessions for students on the values, habits, and life skills needed for health, happiness and success. 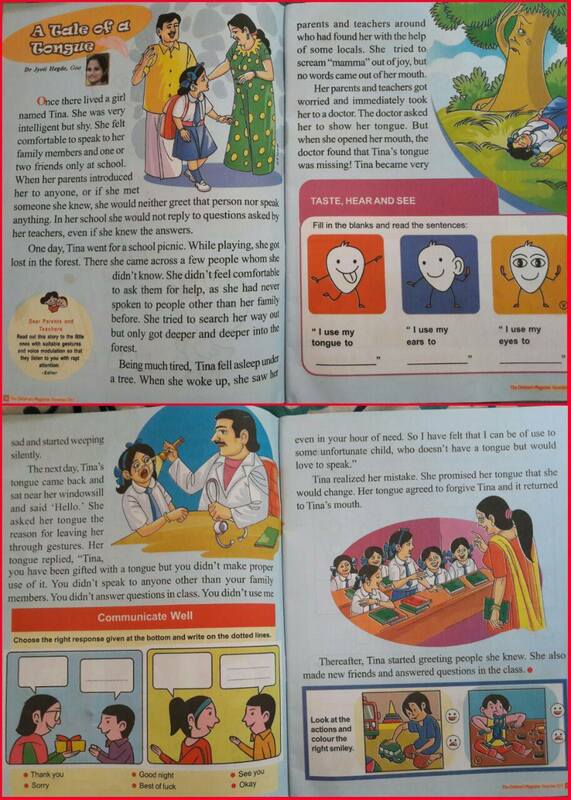 Dr. Jyoti's print book "Stories for Success - Teaching Kids Life Skills through Stories"
Dr. Jyoti Hegde's Speech at Toastmasters Club: The Emotions Express! Dr. Jyoti Hegde is a Corporate Behavioral Trainer and a Life Skills Trainer for students and an internationally published Author. Jyoti has been personally trained and mentored in the field of behavioral training by Corporate Behavioral Trainer, Amey Hegde. Jyoti has also been trained by various master trainers to practice and implement international concepts of Positive Psychology, Facilitation Skills, and Neuro Linguistic Programming (NLP) in developing and conducting training programs. She has completed Basic Intensive Training in Choice Theory, Reality Therapy and Lead Management from CRTI an affiliation of the William Glasser Institute, USA. 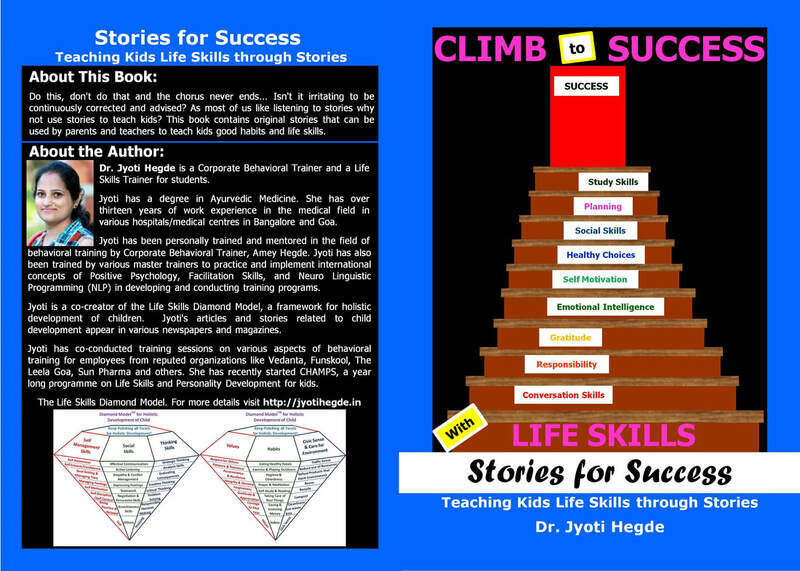 Jyoti is a co-creator of the Life Skills Diamond Model, a framework for holistic development of children. 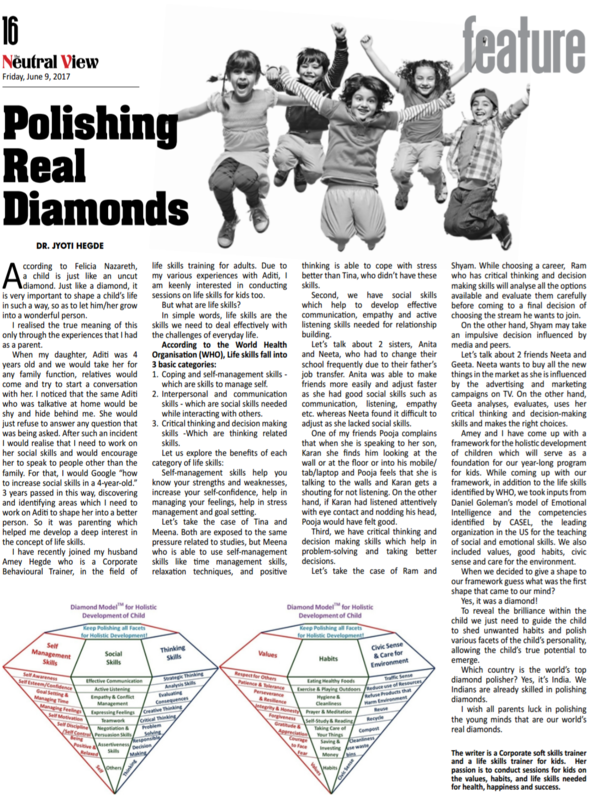 She has created an ebook “Polishing Real Diamonds” containing quotes about child development. Jyoti's articles and stories related to child development have appeared in various newspapers and magazines and she also shares them on her blog http://jyotihegde.in/blog. Jyoti has co-conducted training sessions on various aspects of behavioral training for employees from reputed organizations like Vedanta, Funskool, The Leela Goa, Sun Pharma, IFB and others. She has recently started CHAMPS, a year long programme on Life Skills and Personality Development for kids. She also conducts open-to-public Personality Development and Public Speaking Workshops for students. Jyoti has completed her Competent Communicator (CC) from Toastmasters International, an educational organization that is a world leader in communication and leadership development. Jyoti has won awards in speech and evaluation contests and has represented her club at the Area level contests. The article is about life skills are and why they are important for kids. It will also covers how we came up our Diamond Model framework for the holistic development of children. I liked the below things about the summer camp: Interaction between partners, social skills, food chart, responsibility tree, gratitude diary, DORA METHOD, time management. Children have gained confidence to come ahead and speak in front of a crowd. Overall good concept. Liked to see excitement of kids to come and present. Liked the fun way of learning the good things and making them aware of their little responsibilities and abbreviation method to socialise and all the fun they had. Perfect, excellent. It built confidence and kids performed well in front of people. Nice concept. The kids loved it. We could see what they did. Great for the beginning. The kids were eager to go everyday. We got to see what the kids were doing everyday. Lots of topics covered in such a short time. The daywise activities were organised in a good structured manner. Keep up the good work . We are really happy and satisfied with Dariens excitement. All kids were really amazing when they spoke so well. Well Done!! This workshop has given them the start up and boost their knowledge further! No complains. Enjoyed watching all kids speaking so well! Thanking you so much! Liked to see the active participation of children. Gratitude diary is a good idea. Teaching kids responsibility and time management. It was a great experience for the kids to speak on stage without any fear and many other good things. The methodology that was used was good. Also personal attention was given to each child. Kids have a chance to get over their fears while speaking in public, develop their interpersonal skills. This is very important field where kids can learn to be confident about themselves and get awareness on their responsibilities. It was very useful as kids have learnt to come up on stage without any fear. They learnt about nutrition. Food ludo is very helpful. Kids have learnt to interact with everyone. I saw that my child is become confident. she is become more responsible of her work. She spoke confidently on the stage after attending the camp. I liked the confidence building process in the kids through various activities. Personalised interaction with children. Creatively channelising children's energy. Many did gain confidence. Less number of kids, so more span of attention. I liked the basic food part what children should eat and what not to and most important was the DOIT, NEAR, & DARE. Very informative Camp. The camp was excellent and there was good cooperation among the children. They learnt many things on day to day basis and to eat healthy food and make friends. Covered a wide range of aspects from personality development, food habits, time management, etc. and provided kids a platform to perform to their potential. Liked the contents and concept, personal attention in teaching and the innovative abbreviation. Liked the idea of helping kids prepare learning charts and their presentation. The kids had a lot of interest while they performed. This shows that they were always involved. "Positive and Creative Ideas" is what I saw being given a platform. Keep it up. Liked the initiative to conduct the camp. It was very well organised. What the kids should know for their appropriate age was taught. Very well organised.